The Excalibur Academy Trust is a company limited by guarantee and an exempt charity. The charitable company’s memorandum and articles of association are the primary governing documents of the academy trust. The arrangements for appointing new directors are set out in the articles of association. The articles allow for 2 parent directors, a maximum of 4 foundation directors, up to 5 community directors, the CEO, the Chair of the Chairs Forum and up to 3 co-opted directors. Parent directors are elected by elected parent governors who are members of the academy local governing bodies. Community directors are appointed by the members. Foundation directors are appointed in conjunction with Salisbury Diocesan Board of Education and co-opted directors are appointed by the board. The Board of Directors formally meets at least five times per academic year. Exceptional meetings can be called at any time if circumstances dictate. Quorum is one third of the membership, excluding vacancies. There are a number of working committees: Local Governing Bodies at each academy; Finance, Premises & ICT; Admissions; Staffing; Audit; plus a LGB Chairs Forum. The committees meet at least four times per year to review, evaluate and monitor the activities covered by their terms of reference. The local governing bodies meet at least six times per year, more often if priorities warrant additional time. The admissions committee meets as required. relationship between the academy and the local community. 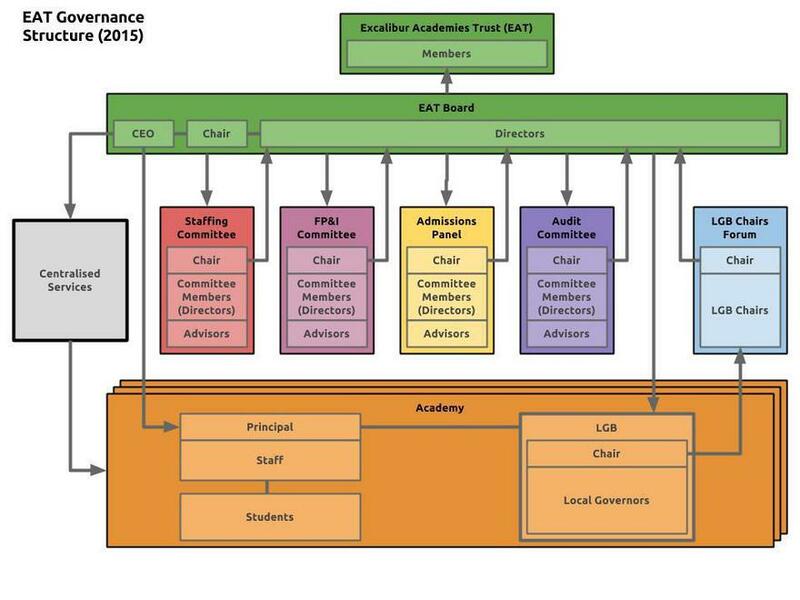 A structure showing the relationship between the Trust Board, committees and the individual academies is shown below. Our governors form the Local Governing Board (LGB) within Excalibur Academies Trust, the structure of which is published on the previous page. It is also available, along with further information, on Excalibur's website. The role of the LGB is to work with the school to ensure we are providing the highest standards of teaching and learning. The LGB also works with the school to further our work within the local community. The Chair represents our school at the LGB Chair's Forum which reports to the Directors of Excalibur Academies Trust. Our LGB is made up of elected representatives of the staff and parents. We have foundation governors (who represent the interests of our church status) as well as community governors. The governors can be contacted via the clerk (Cathryn Poole): cathryn.poole@excalibur.org.uk. Oare C of E Primary School is committed to safeguarding and promoting the welfare of children and young people and we expect all staff and volunteers to share this commitment. Our Designated Safeguarding Lead is Gudrun Osborn. The Deputy Safeguarding Lead is Allison Davies. Our Safeguarding Governor is Jeanette Longhurst.